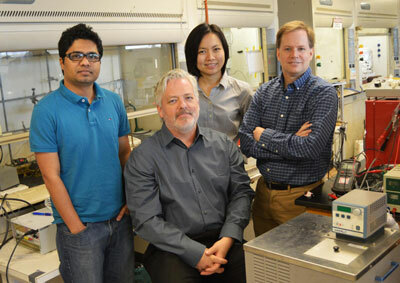 (Nanowerk News) A team of University of Texas at Arlington chemists and engineers have proven that concentrated light, heat and high pressures can drive the one-step conversion of carbon dioxide and water directly into useable liquid hydrocarbon fuels. In an article published today in the Proceedings of the National Academy of Sciences ("Solar photothermochemical alkane reverse combustion"), the researchers demonstrate that the one-step conversion of carbon dioxide and water into liquid hydrocarbons and oxygen can be achieved in a photothermochemical flow reactor operating at 180 to 200 C and pressures up to 6 atmospheres. From left: Mohammad Fakrul Islam, Frederick MacDonnell, Wilaiwan Chanmanee and Brian Dennis, all of UTA. "We are the first to use both light and heat to synthesize liquid hydrocarbons in a single stage reactor from carbon dioxide and water," said Brian Dennis, UTA professor of mechanical and aerospace engineering and co-principal investigator of the project. "Concentrated light drives the photochemical reaction, which generates high-energy intermediates and heat to drive thermochemical carbon-chain-forming reactions, thus producing hydrocarbons in a single-step process." Duane Dimos, UTA vice president for research commended the researchers on their success. "Discovering a one-step process to generate renewable hydrocarbon fuels from carbon dioxide and water is a huge achievement," Dimos said. "This work strengthens UTA's reputation as a leading research institution in the area of Global Environmental Impact, as laid out in our Strategic Plan 2020." The hybrid photochemical and thermochemical catalyst used for the experiment was based on titanium dioxide, a white powder that cannot absorb the entire visible light spectrum. "Our next step is to develop a photo-catalyst better matched to the solar spectrum," MacDonnell said. "Then we could more effectively use the entire spectrum of incident light to work towards the overall goal of a sustainable solar liquid fuel." The authors envision using parabolic mirrors to concentrate sunlight on the catalyst bed, providing both heat and photo-excitation for the reaction. Excess heat could even be used to drive related operations for a solar fuels facility, including product separations and water purification. The research was supported by grants from the National Science Foundation and the Robert A. Welch Foundation. Wilaiwan Chanmanee, postdoctoral research associate in mechanical and aerospace engineering, and Mohammad Fakrul Islam, graduate research assistant and Ph.D. candidate in the department of Chemistry and Biochemistry at UTA, also participated in the project. MacDonnell and Dennis have received more than $2.6 million in grants and corporate funding for sustainable energy projects over the last four years. MacDonnell and Dennis' investigations also are focused on converting natural gas for use as high-grade diesel and jet fuel. The researchers developed the gas-to-liquid technology in collaboration with an industrial partner in UTA's Center for Renewable Energy and Science Technology, or CREST, lab, and are now working to commercialize the process. MacDonnell also has worked on developing new photocatalysts for hydrogen generation, with the goal of creating an artificial photosynthetic system which uses solar energy to split water molecules into hydrogen and oxygen. The hydrogen could then be used as a clean fuel.